Chances are if you mention Dorothy Blaine in Superior, Wisconsin, nobody will recognize the moniker—Blaine was a stage name. A few might know her by her maiden name, Dorothy O’Kash, or by her married name, Dorothy Gamsa—but outside of her family few know the story of Dorothy’s life after her graduation from Superior’s Central High School in 1935. She is not included in lists of that school’s many famous graduates. In fact, Dorothy’s only notoriety in Superior circles today is as the eccentric and somewhat-reclusive younger sister to Molly (O’Kash ) Muench (aka Molly Spaun), owner of Superior’s legendary Molly’s Bar. Only a very few know that Dorothy Blaine led a life of glamour, singing in the best clubs on the New York circuit, rubbing elbows with the likes of Jackie Gleason, Dean Martin, Frank Sinatra, and other celebrities of that age. Dorothy grew up in a rough-and-tumble family with three brothers and five sisters living in the rooms above the Blue Moon, her parents’ bar on North Third Street in Superior’s notorious waterfront district. From the time she was a young girl she dreamed of a career on stage. Family members recall that she was always singing or humming songs she heard on the radio. She sang with the glee club throughout high school and frequently performed leading roles in dramatic productions. While a senior, she won an amateur-night prize at a local club, the Heidleberg at Eighth Street and Tower Avenue. She was asked back for several return engagements and before long she was singing in clubs on both sides of the bridge, including Duluth’s Flame and The Ritz in Superior. In 1937 she left Superior to accept an engagement at Milwaukee’s Blue Moon Café. Shortly afterwards, she appeared at the Club Forest, also in Milwaukee. Then it was off to Chicago, where she studied voice and stage culture in the pursuit of a career in entertainment. She worked at it: A collection of her sheet music shows her hand-written notations of when to breath and suggested hand gestures. Dorothy’s classic beauty rivaled her talent—she was often compared to Lauren Bacall and Judy Garland. She worked for a short time as a commercial model in Chicago, appearing in dental ads thanks to her perfect teeth and enchanting smile. But performing remained Dorothy’s true love. 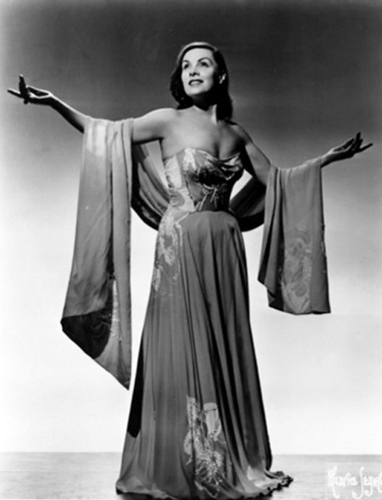 After appearing in numerous Chicago venues, such as the Camellia Room in the famous Drake Hotel, Dorothy got her break, appearing as the featured performer at Harry’s New York Cabaret in Chicago. While in Chicago Dorothy met and married theatrical agent Senia Gamsa, who later became a New York producer. In 1938 Senia succeeded in booking Dorothy, who was barely 21 years old, into a six-week engagement in New York City. According to the Superior Telegram, Dorothy took New York by storm. Immediately afterward she and Senia were off to Hollywood for screen tests at Twentieth Century Fox and other studios. Why Dorothy never appeared on the big screen remains a mystery. Family members have conflicting recollections—either an untimely car accident voided contractual obligations or Dorothy’s husband nixed an offer from RKO Pictures because of his distrust of Howard Hughes. But Hughes didn’t take over RKO until 1948, ten years after the screen tests. Dorothy herself told at least one family member that she’d dubbed the singing for several big screen starlets and was sworn under contract to never reveal the stars’ names or which films her voice appeared in—and she never did. To go out into the world, one must have what it takes—it takes hard work, time and effort on a 24-hour-a-day basis. There is no letting up. The performer is only as good as the last show. After Senia’s death in the late 1950s, the performing life lost much of its glamour for Dorothy. She returned home to the comfort and security of her family, where she lived out the rest of her life in relative obscurity. Dorothy died in Superior on March 25, 2015, at the age of 98.